← #Q #QAnon 3-20-19… HUGE number of Q posts (3131-3060) related to (exposing) Human Trafficking, etc. Here’s the full weekly report from Ben. A lot of information coming out here, which will be expanded upon in the full article. “The battle to free humanity from a cult of human-sacrificing Satan worshipers… is reaching a key turning point as intense battles rage on multiple fronts. In essence, the battle is between the masses, allied with the military of most countries, against a deeply entrenched top-level elite… we are dealing with a millennia-old control system that does not intend to go quietly into the night. 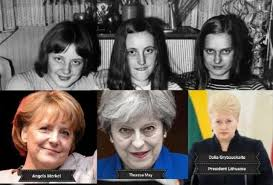 “…last week Russian intelligence provided us with evidence that not only German Prime Minister Angela Merkel, but also British Prime Minister Theresa May and Lithuanian President Dalia Grybauskaite are “all three the biological daughters of Hitler Rothschild and the Kasners.”… They also note that May, who is trying her hardest to block Brexit, makes the same satanic “eye of the pyramid” hand sign as Merkel. “…in Canada, we have Prime Minister Justin Castro-Sinclair… [who] has revealed his true colors by betraying decades of Canadian foreign policy with blind support for Nazi regimes in the Ukraine and Israel and by refusing to take the Bank of Canada out of cabal control. “So who do all these people ultimately report to? The answer is not fake Jews like Israeli Prime Minister Benjamin Netanyahu. Netanyahu is just a sub-boss who reports to the Black Sun worshipers in Italy and Switzerland… if we are to liberate humanity, we need to understand exactly who we are dealing with, and that means we have to go down another deep rabbit hole and look at one of the secret ruling families: the Farnese. “…at this point we need to show readers just how relevant all this is to current events. Let us start with the slaughter at the mosque in New Zealand last week. The shooter has a Black Sun emblem on his backpack… it was a sacrifice to Satan that was intended to invoke power for the cabal… the involvement of the Italian Mafia, who take orders from the Black Sun worshipers, in recent events involving North Korea and U.S. President Donald Trump. “…the war of the people against the cabal continues to rage. The most damaging of these attacks were directed against cabal-controlled high tech companies. Criminal and anti-trust charges are now being prepared against Google, Facebook, and many other high-tech companies, as has been widely reported. These companies are all going to be broken up and many of their executives will go to jail, Pentagon sources say. “These high-tech companies are, like the rest of the cabal, not going to give up without a fight. Last week two whistleblowers came forth to warn us they were planning to use 5G technology to maintain their control over, or possibly even murder, most of humanity… We were also contacted by a former South African intelligence officer who said the South African apartheid regime had used electromagnetic carrier frequencies to manipulate the behavior of black Africans. The battle to free humanity from a cult of human-sacrificing Satan worshipers (Ba’al, Molech, etc.) is reaching a key turning point as intense battles rage on multiple fronts. In essence, the battle is between the masses, allied with the military of most countries, against a deeply entrenched top-level elite. People who are wondering why no mass arrests have taken place need to understand that we are dealing with a millennia-old control system that does not intend to go quietly into the night. To understand how deep the rabbit hole runs, please take a look at the diagram below. This chart is not just about ancient history, but rather represents a system that still to this day controls most top world rulers. 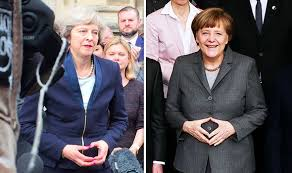 They also note that May, who is trying her hardest to block Brexit, makes the same satanic “eye of the pyramid” hand sign as Merkel. Then in Canada, we have Prime Minister Justin Castro-Sinclair, who may have murdered his half-brother Michel Trudeau (whose body has never been found). Castro-Sinclair’s mother, Margaret Sinclair, is the daughter of James Sinclair of the bloodline that founded Scottish Rite Freemasonry. Castro-Sinclair has revealed his true colors by betraying decades of Canadian foreign policy with blind support for Nazi regimes in the Ukraine and Israel and by refusing to take the Bank of Canada out of cabal control. It is also well documented that French President Emmanuel Macron is a Rothschild slave. In fact, most so-called world leaders are slaves, as we have written about previously. So who do all these people ultimately report to? The answer is not fake Jews like Israeli Prime Minister Benjamin Netanyahu. Netanyahu is just a sub-boss who reports to the Black Sun worshipers in Italy and Switzerland. This was proven by his well-documented involvement in the Fukushima mass-murder attack against Japan. This attack was directed by former top Jesuit Peter Hans Kolvenback, who claimed he was Satan right after it happened in a telephone conversation recorded by the NSA, Japanese military intelligence sources confirm. So, if we are to liberate humanity, we need to understand exactly who we are dealing with, and that means we have to go down another deep rabbit hole and look at one of the secret ruling families: the Farnese. The images below show their family fortress, the original pentagon, the Pentagon in Washington—whose creation they masterminded—and a 16th century map showing that way back then they had already made plans for Washington, D.C. to be the center of a world Roman fascist, Babylonian government. Okay, at this point we need to show readers just how relevant all this is to current events. Let us start with the slaughter at the mosque in New Zealand last week. The shooter has a Black Sun emblem on his backpack. We are not going to go too deeply into the true nature of this attack (because it has been well documented elsewhere), other than to comment it was a sacrifice to Satan that was intended to invoke power for the cabal. Now let us look at the involvement of the Italian Mafia, who take orders from the Black Sun worshipers, in recent events involving North Korea and U.S. President Donald Trump. Notice that after the summit meeting between Trump and North Korean strongman Kim Jong Un failed, Chinese President Xi Jinping postponed his planned March visit to the U.S. to meet with Trump. Instead, he is flying this week to Italy, to meet the real bosses. …“The Italian-American Mafia promised success in the meeting between Trump and Kim Jong Un because they had carried out a money-laundering operation in favor of North Korea.” However, the source continued, “The meeting failed because the ideological geopolitics of the power blocks was stronger than the money.” As a result, the Gambino family was forced to pay for the huge losses incurred, as they found themselves stuck with piles of worthless North Korean currency, he said. Also connected to this was the raid on the North Korean embassy in Spain that took place just before the Kim/Trump summit. The raid was by “North Korean dissidents,” according to the U.S. press and “by the CIA,” according to Spanish papers. What is not disputed is that computers and mobile phones were seized in the raid, and Japanese military intelligence say these contained information about Mafia/North Korean money-laundering operations. In any case, the P2 Freemason and Black Sun worshiping sources say they are now trying to negotiate the creation of a “world federation government” with Asian secret societies. These high-tech companies are, like the rest of the cabal, not going to give up without a fight. Last week two whistleblowers came forth to warn us they were planning to use 5G technology to maintain their control over, or possibly even murder, most of humanity. One whistleblower, an executive at a major technology company that produces 5G equipment, says it is extremely dangerous technology. Unlike when 3G and 4G were introduced, this source says the top management are pushing hard for 5G implementation without any proper safety testing. The “5G wavelength is very similar to that of the human brain so that it can be used for mind control,” he said. He also said that while 3G signals hit people like a basketball and 4G like a golf ball, 5G was more like a needle and could cause brain damage. Also, he warned that 5G would require transmission towers every 100 meters and would be extremely intrusive and saturate the environment with dangerous electromagnetic waves. He said no living creature, even microbes, could survive in his company’s 5G testing laboratory. This executive also advised me to not carry my 4G smartphone on my body and to put it in airplane mode when I went to sleep. I took his advice and can report I slept longer and deeper as a result. British intelligence sources say the Anglo-Saxon Five Eyes Group is aware of these dangers and that is why they are putting the brakes on 5G and also why they are asking the Chinese to do so as well. “The other military-industrial complex stalwart, Lockheed, is losing sales of the crappy F35 to allies like Turkey, Taiwan, and Germany,” the source notes. The Pentagon sources added, “Russia builds better and cheaper weapons,” which was another reason Trump needs to continue to drain the swamp.